Constrained optimization problems are problems for which a function is to be minimized or maximized subject to constraints . Here is called the objective function and is a Boolean-valued formula. In the Wolfram Language the constraints can be an arbitrary Boolean combination of equations , weak inequalities , strict inequalities , and statements. The following notation will be used. stands for "maximize subject to constraints ". You say a point satisfies the constraints if is true. The following describes constrained optimization problems more precisely, restricting the discussion to minimization problems for brevity. A point is said to be a global minimum of subject to constraints if satisfies the constraints and for any point that satisfies the constraints, . A value is said to be the global minimum value of subject to constraints if for any point that satisfies the constraints, . The global minimum value exists for any and . The global minimum value is attained if there exists a point such that is true and . Such a point is necessarily a global minimum. 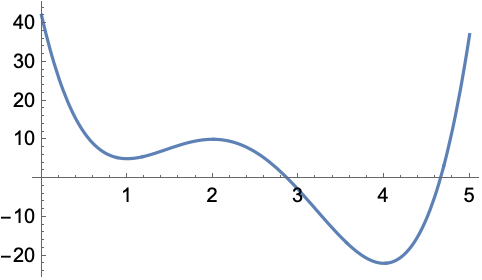 If is a continuous function and the set of points satisfying the constraints is compact (closed and bounded) and nonempty, then a global minimum exists. Otherwise a global minimum may or may not exist. A point is said to be a local minimum of subject to constraints if satisfies the constraints and, for some , if satisfies , then . A local minimum may not be a global minimum. A global minimum is always a local minimum. The methods used to solve local and global optimization problems depend on specific problem types. Optimization problems can be categorized according to several criteria. Depending on the type of functions involved there are linear and nonlinear (polynomial, algebraic, transcendental, ...) optimization problems. If the constraints involve , you have integer and mixed integer-real optimization problems. Additionally, optimization algorithms can be divided into numeric and symbolic (exact) algorithms. Wolfram Language functions for constrained optimization include Minimize, Maximize, NMinimize, and NMaximize for global constrained optimization, FindMinimum for local constrained optimization, and LinearProgramming for efficient and direct access to linear programming methods. The following table briefly summarizes each of the functions. Summary of constrained optimization functions. Here is a decision tree to help in deciding which optimization function to use.